2nd - Eusebius of Vercelli Bp. 4thC. Laboured against the Arian heresy, which denied divinity of Christ; established monasticism in his diocese. 3rd - St. Lydia - 1stC. Paul's first convert at Philippi and was baptized with her household, after which Paul stayed at her home. Was born at Thyatira famous for its dye works, and by profession Lydia was a dye seller. 4th - Jean-Baptist Vianney Curé d'Ars Spiritual guide 1859 Despite his poor academic qualifications was ordained through the holiness of his life. Spent his life in the remote village of Ars, but his reputation in preaching and spiritual counselling drew hundreds each day. 5th - St. Oswald, King & Martyr 642. Worked closely with St. Aidan to bring the Gospel to Northumbria. Killed defending his kingdom by heathen king, Penda. 6th - Transfiguration of our Lord on the mount, pperhaps Mt. Tabor. Originated in Eastern Church, where it prefigures His resurrection and glory. The glory of the Lord shone so brightly that it dazzled the three apostles. 7th - John Mason Neale, Priest - 1866. Prolific hymn writer who translated many of the old Latin and Greek hymns into English, and founder of society of St. Margaret, a community for women. - St. Sixtus II & his companions, Bishop & Martyr. Martyred during the time of persecution of the Church under Valerian in 258. He and his deacons were taken when Sixtus was preaching in the catacomb of Praetexatus and executed. - St. Catejan, priest, 1547. Founded the Congregation of Clerks Regular in Rome to foster the Church's mission, and extended it into Venice and Naples. A man of prayer and compassion. 8th - St. Dominic, Priest 1221. Founder of the Order of Preachers to teach the Faith against the Albigensian heresy which taught that all matter was evil. 9th - St. Romanus, Martyr, 258. A Roman soldier converted by Laurence. Buried on the road to Tivoli. Mary Sumner, Founder of the Mothers; Union, 1921. An initial meeting in 1876 by Mary resulted into what became an international organisation, The Mothers Union to uphold the values fo Christian and family life. 10th - St. Laurence, Deacon & Martyr, 258. Martyred with many others, including Sixtus II during a severe persecution of clergy and confiscation of sacred books and vessels under Valerian. 11th - St. Clare of Assisi, Religious 1253. Founder of Poor Clares whose Rule was St. Francis'. When Francis was blind and ill, she erected a hut for him at her San Damiano convent. It was here that he composed Canticle of the Sun, not long before his death. - John Henry Newman, Cardinal, 1890. Instrumental in upholding the Tractarian movment of the 19thC. Converted to Roman Catholicism in 1845 where he continued to make an outstanding contribution to theology. 12th - St. Jambert, Abbot & Archbishop, 792 Abbot of St. Augustine's, Canterbury before his consecration as bishop in 765 and appointment as Archbishop of Cantaur. Stood his ground against the pagan King, Offa, who wanted to diminish the importance of see of Canterbury. - St. Murtagh, Bishop, 6thC. Venerated as the first bishop of Killala, and as founder of Innismurray, a fertile monastic island. 13th - Jeremy Taylor, Bishop& Casuist, 1667 One of the most saintly divines of the 17thC. who ended his life as Bp. of Down & Connor in Ireland. His Holy Living & Holy Dying has inspired many. - Maximus the Confessor, Abbot, 662. Noted for his theological writings, esp. on the Incarnation. Fought for the Orthodox faith against the Emperor, Constans' monothelitism. Imprisoned for 6 years, and then had his right hand and tongue amputated. Died shortly afterwards. - - - Hippolytus, Martyr & Liturgical Writer, 235. Anti-Pope against Callistus whom he accused of being too lenient towards the lapsed and herectical. He and Pontianus were exiled to Sardinia during the persecution of Maximinus where they were both martyred. The bodies returned to Rome under Fabian. Hippolytus is best known for the Apostolic Tradition, which account of the Canon of the Mass is the basis still for one of the Canons of the Mass. - Florence Nightingale, Social Reformer & Nurse, 1910. With exceptional perseverance trained in nursing and by 1853 achieved her goal to head her own private nursing institute in London. She and her nurses went to Crimea to care for the wounded a year later. Largely responsible for elevating nursing into a profession for women. Her mystical religion sustained her through many years of poor health. A most remarkable woman. - Octavia Hill, Social Reformer & Teacher, 1912. Appalled at the living conditions of many of her pupils borrowed money and pioneered housing reforms in East London. A woman of great faith and humility. 14th - Maximilian Kolbe, Friar & Martyr, 1941. Sent to Auschwitz v. early in W.W. II where he continued his priestly ministry. Gave his life in exchange for another facing execution. 15th - DORMITION OF OUR LADY- Mary's departed this life and was assumed into heaven to sit beside her Son in glory. Pray for us O Holy Mother of God, that we may be worthy of the fruit of your womb, Jesus. 16th - Stephen of Hungary, King and Confessor, King, 1038. Converted his kingdom to the Faith. Established monasteries, and set the example of Christian living. 17th - St. Hyacinth, Dominican, 1257. Received his habit from St. Dominic. Known as the Apostle to Poland. A great missionary who preached in many countries including Tibet, Sweden, Russia and China. 18th - St. Helena, Empress, 330. Remembered for finding the Cross on which our Lord died and for building the Church of the Holy Sepulchre over this spot. Refer also to September 14th. 19th - St. John Eudes, Priest and Oratorian, 1680. Founder of the Congregation of Jesus and Mary. Helped "fallen" women and promoted devotion to the Sacred Heart. 20th - St. Bernard, Abbot & Doctor 1153. Established the new Cistercian monastery at Clairvaux in France. A renowned theologian and writer. Last of those referred to as the "Fathers" of the Church. Healed divisions within the church, but vitriolic in his attack on Peter Abelard's theological opinions. 21st - St. Pius X, Pope, 1914. When appointed Pope took as his motto "to renew all things in Christ." Tried to fulfil this in the spirit of simplicity and poverty. Encouraged frequent communion and the admission of children to it from the age of seven. However his stand against Modernism was a retrograde step and it took years for the Church to recover. 22nd - Alexander, Martyr c.250 With his companion Epimachus was a martyr in Alexander from a terrible death. - Sigfrid, Abbot, 688. Abbot of Wearmouth, and noted for his knowledge of Scripture, temperance and obedience. 23rd - Rose of Lima, Virgin 1617. First saint of America, and patron saint of S. America & Philippines. Took a vow of virginity & joined the 3rd Order of St. Dominic. Lived a life of penance and contemplation as an offering for the salvation of the Indian people, and in reparation for the corruption of her contemporary society. 24 - ST. BARTHOLOMEW Apostle. Probably is Nathaniel whom Philip brought to Jesus in John 1.45ff. Tradition has it that he went to India where he suffered martyrdom. 25th - St. Louis IX of France, King 1270. A most holy and charitable man who belonged to the 3rd Order of St. Francis. Built that magnificent Gothic chapel in Paris, St. Chapelle as a shrine to house the relic of Christ's crown of thorns. During his life the university of Paris was founded by his friend Sorbonne. Thomas Aquinas was also a friend. Died on crusade to the Holy Land. 26th - Bregowine, Archbishop of Canterbury, 764. A Saxon who became a monk in England after attending the school founded by Theodore. Appointed archbishop in 761. 27th - St. Monnica, holy matron- 387. 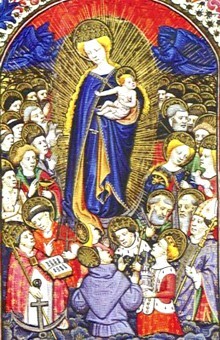 Mother of the great Augustine. Prayed and wept for her son, and his conversion filled her with joy. Married to a pagan, prayed for his conversion as well as that of her son. "She never let me out of her prayers that you, O God, might say to the widow's son, 'Young man, I tell you arise.'" Died shortly after Augustine's baptism, as her life's mission had been achieved. In a very moving scene, A. describes this in The Confessions. - St. Caesarius of Arles, Monk & Bishop (542). Remarkable preacher. Reminded his congregation on Sunday to "match your behaviour to the words you sing" during the week. Promoted the importance of the Liturgy and the Offices. Wrote a rule for the nunnery he founded for his sister, which influenced Benedict. 28th - St. Augustine of Hippo, Bishop & Doctor, 430. His Confessions, a moving account of his conversion & ultimate baptism by St. Ambrose. Should be read for its sheer beauty & spirituality. Probably the most influential theologian in the Church for over 1,000 years. 29th - The beheading of John the Baptist. From the Gospels of Matthew & Mark it is clear his denunciation of immoral ways such as the marriage of Herod and Herodias led to his arrest and then beheading. On hearing of John's arrest, our Lord's 1st words were those of John, "Repent for the kingdom of heaven is at hand". 30th - John Bunyan Spiritual Writer, 1688. Best known for his Pilgrim's Progress, the account of Christian's journey. - Margaret Clitherow, Anne Line & Margaret Ward, Martyrs, 1586, 1588, 1601. Among the 40 martyrs of England canonised by Paul VI in 1970. These women were executed for harbouring priests in their homes. 31st - St. Aidan, Abbot, Bishop & Missionary, 651. Loveliest of all Celtic saints who lived on the Holy Island (Lindisfarne). By invitation of King Oswald came to Northumbria to proclaim the Gospel. He & King worked closely to make the kingdom Christian. 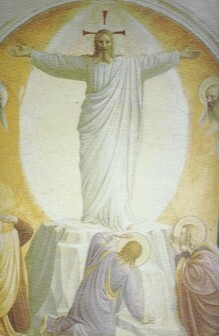 THE TRANSFIGURATION OF OUR BLESSED LORD ON MT. TABOR OR MT. HERMON. Before Peter, James and John His glory shone all around and His garments were as white raiments. shedding upon them the light of your power. 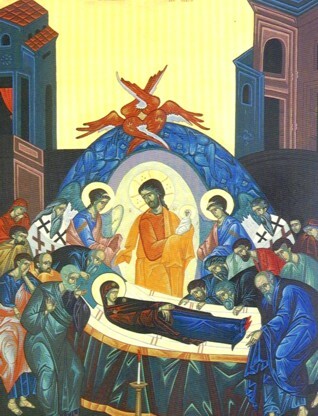 THE DORMITION/ASSUMPTION ON 15TH AUGUST.